I didn’t have very much time to make a dessert for Christmas dinner, so I decided to make chocolate pot de crème by Michel Bras. I had some praline left over so, I decided to flavour the cream with it. Make sure to strain the praline out before combining the chocolate and butter into cream. Boil the cream. Melt broken chocolate pieces with butter. Beat thoroughly with a whisk. 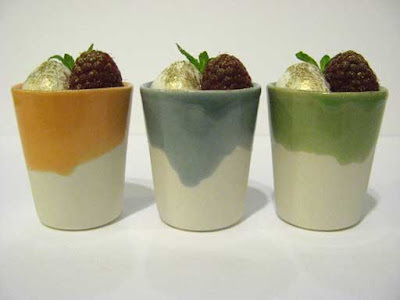 Pour into ramekins and keep cold until ready to serve. * Flavour the cream with coffee or praline, if you wish. 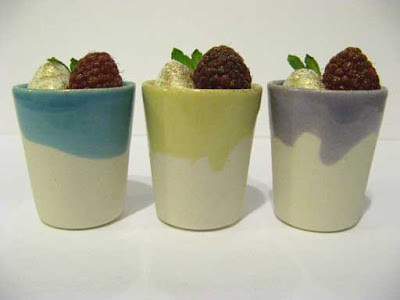 I found these cute shot sized ceramic cups at this years One of a Kind exhibition in Toronto. When I bought these, I had pot de crème exactly in mind. Posted by Sam at 5:17 p.m.
looks really wonderful and delicious! I was going to ask you where you got your lovely cups and where I could get some, then I read to the bottom of your post. Nuts! The One of a Kind show is great though, there's so much neat stuff. Thanks for visiting and for your nice comment Jann. Happy Holidays! Hey Brilynn, Happy Hoildays! I forgot the name of the potter, but if I find out, I will let you know. Maybe he will be at the One of a Kind show in the spring. Cheers! Hello, Sam, Happy New Year!